Mega Sale! Save 29% on the Seed Needs, Habanero Seed Collection (6 Individual Packets) Non-GMO by Seed Needs at Black Ant King Plus. Hurry! Limited time offer. Offer valid only while supplies last. This Habanero Pepper assortment includes 6 of our best selling peppers. It is comprised of red, lemon, peach, orange, white and chocolate as well. 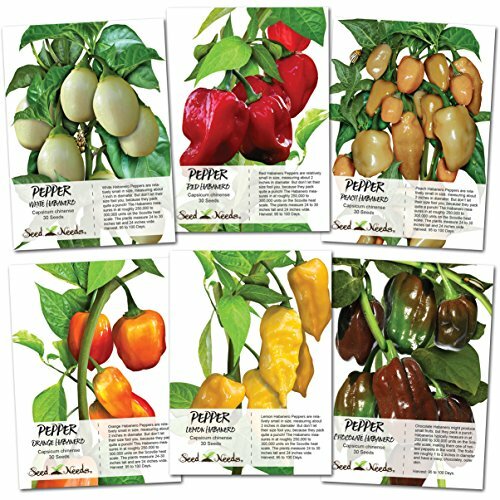 This Habanero Pepper assortment includes 6 of our best selling peppers. It is comprised of red, lemon, peach, orange, white and chocolate as well. The plants grow to a mature height of roughly 24 to 30 inches tall, producing small lantern like fruits. Their size is not relative to their kick however, as Habanero Peppers range anywhere between 250,000 and 300,000 units on the Scoville heat scale. The packets measure 3.25" by 4.50" in dimension and come complete with a colorful illustration on the front side, as well as detailed sowing instructions on the reverse as well. If you have any questions about this product by Seed Needs, contact us by completing and submitting the form below. If you are looking for a specif part number, please include it with your message.